The MMA world has been buzzing for a week following comments made by UFC fighter Frank Mir. 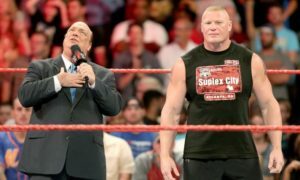 Mir’s comments specifically about wishing death upon current UFC heavyweight champion Brock Lesnar have set off a fire storm. The UFC and MMA community responded with outrage and some in disappointment with Mir’s tone. However at the end of the day Frank Mir proves once again why he drew the biggest buyrate in UFC history and is one of the few that truly gets the show. Think about it for a minute. The same company that rewards fighters based on the best knockout of the night is outraged by something a fighter says to hype a fight. The same company that will fire a fighter with who fights an artful yet not dazzling fight, as opposed to a losing fighter who swings for the fences is outraged by something a fighter says? Does anyone not grasp what happens to someone who does get knocked out? Yes, the hypocrisy here shown by the UFC and critical fans is beyond laughable at this point. It all started when Frank Mir was asked about Brock Lesnar during a radio interview with WXDX radio. Mir in a never ending quest to break two million buys for a trilogy with Lesnar said, “I want to fight Brock Lesnar. I hate who he is as a person. I want to break his neck in the ring. I want him to be the first person that dies to Octagon-related injuries.” Those are pretty some strong words indeed, maybe the most intense ever uttered by a UFC fighter. UFC president Dana White did not appreciate Mir’s WWE approach to his potential grudge match with Lesnar. Dana White said, “Mir was “a [expletive] idiot” and that he “never heard something so unprofessional and idiotic in his life.” Was Dana talking about Mir’s interview or Dana White’s rants on female MMA writer Loretta Hunt? C’mon Dana, between you and me this is the greatest hype the UFC has ever seen right? Finally someone who knows something about selling fights and drawing big buy rates weighed in on this controversy. You know this story has taken a turn for the worse when it takes a WWE Hall of Fame pro wrestler to settle the situation down. “Stone Cold” Steve Austin wrote on his Twitter page, “Frank Mir got a little carried away on his promo. but i love watching the guy fight. he a and brock lesnar are the hatfields and mccoys of the ufc.” Somebody pop a cold one for old Stone Cold! Frank Mir was finally forced to apologize for his comments. Mir said to SI.com, “No one’s been able to explain it to me yet. I thought we understood that what we say on camera is part of the entertainment aspect of our sport and we kind of get a little artistic license. It’s not like I said this to my neighbor, that if his dog shows up in my yard one more time I’m going to kill him. That would be bad. That’s a problem. I didn’t understand it, but hey, it came my way, I said it, and I can’t cry about it now. I’ve just got to deal with it, I guess.” Amen! I couldn’t have said this any better myself. Some bloggers have even asked that Mir be arrested for threatening Lesnar’s life. Seriously? This is where I find the outrage here from the UFC, MMA fans, and writers to be a complete joke. I could see a situation where you have Mir threatening a security guard or following in the footsteps of his boss and ranting like a lunatic about a female reporter. But here is a guy that makes his living off of selling fights. These guys aren’t fighting in a high school gym or at the Olympics. This is a sport that sells fights and entertains just like boxing and at times like pro wrestling. There is a reason that Tito Ortiz vs. Ken Shamrock broke records. There is a reason that Brock Lesnar vs. Frank Mir II broke records. Nobody thought that these were going to be two great fights. People watched or bought these fights because of the hype thanks to all of the fighters involved. Personally, I think that all MMA fighters should take a lesson from Frank Mir in how to sell a fight. Muhammad Ali is one of the most revered athletes in all of sports history for his talents and his abilities to hype fights. Hey, at least Frank Mir didn’t use an racial slurs right? I think the biggest area for improvement in the UFC and MMA in particular is getting their fighters to understand that part of their job is to sell their fights on interviews. Some of these guys not only miss that point, but there are times when you have guys wasting their interview time talking about fights that MMA fans will never see. I love a great MMA bout, but I also love a well hyped fight. Getting the best of both worlds will only benefit everyone in the end. Frank Mir has probably done more to help his sport last week than anyone else. It’s not what they’re saying about the UFC and Frank Mir, but as long as they are both being talked about than Mir is doing the best job in MMA.